Asylum seekers are talented. 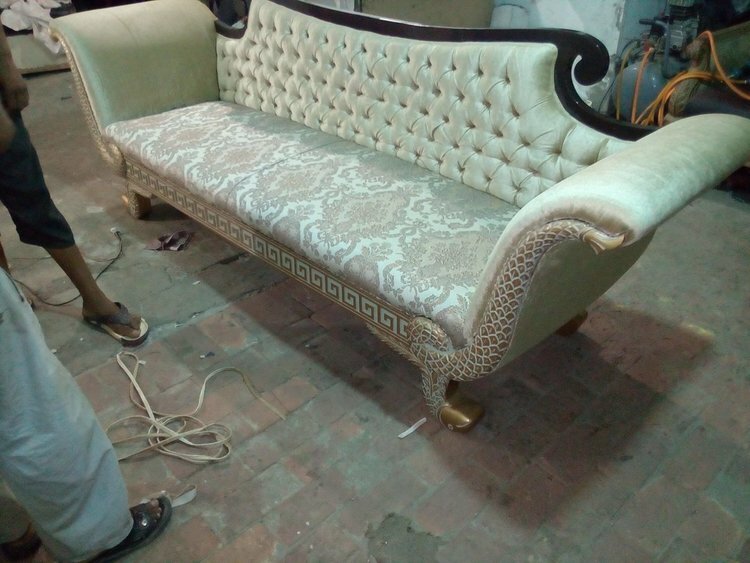 Some have skills to make fine furniture like this, but their talents and abilities go unrecognized. Who are the asylum seekers we are helping? If you are familiar with the Love Movement’s story, then you know that we got involved helping asylum seekers through a contact made by a Pakistani Christian facing problems in Pakistan. So most of the families we help are Pakistani Christians. There are nurses, teachers, technicians, furniture makers, tailors, drivers, scrap dealers, welders, chefs, and people of a whole host of other professions who have come to Bangkok to seek asylum. Many skilled people. But their worth is not seen once they become asylum seekers. They take a low position in the society here, and they are not recognized for the talents and abilities they have. In Pakistan, Christians are a small minority, perhaps 2%, of the population. They face general discrimination on the part of the majority population. For example, a friend of ours, as a boy, asked for a glass of water at a shop. When the shop owner discovered he was Christian he expressed dismay and made it a point to show his displeasure by throwing away the glass from which he drank. Of course experiences like this make a strong impression on innocent children, and they grow up with a sense of sadness as they begin to realize their position in society and their lack of opportunities for advancement because of discrimination. Specifically, the asylum seekers have suffered an array of abuses that drove them to seek refuge in Bangkok. We know families where the ladies were raped and then their houses, well over 100, burned down as a result of a blasphemy accusation against a Christian man living in that Christian neighborhood. Some were severely beaten by radicals, some were beaten even by police. One friend was arrested for peacefully participating in a labor strike and then she and her fellow Christians among the arrestees were singled out and beaten by police. One lady who was pregnant lost her baby because of the beating, another died in the hospital. Some had businesses and property stolen from them. Virtually all of them faced life-threatening situations. Many of the cases involved Pakistan’s infamous anti-blasphemy law, which can carry a death penalty. Accused of blasphemy or no, many involved ultimatums to convert to Islam or die. One was at the hands of a mullah against a Christian barber who was outraged after he learned that his hair was being cut by a Christian after he stopped in his shop in a popular mall. Another was a Christian furniture maker who arrived to work one day to find his room at his factory had pages of the Quran strewn all over the place and the only way he could escape blasphemy charges was to convert to Islam. So, facing unbearable challenges, they fled to Bangkok to seek asylum. And then another series of problems began. In spite of their asylum seeking status with the UN, the great majority can’t legally stay in Thailand. So they are essentially hunted by immigration, and if caught they are sent to the immigration detention center where they face indefinite detention. Which forces them into hiding and leading a fearful existence, unable to work to support themselves. Thank God their physical safety is generally not threatened, but it is another type of persecution that takes a big psychological toll. Just the long drawn out process that seems never ending, spanning as it does different countries and many years is a difficult situation to endure. In a word, these people are blessed. Wait, you say? Blessed? You just described all the terrible problems and you say they are blessed? It’s true. Principles are involved that make these people blessed. These words of Jesus affirm it: “Blessed are they which are persecuted for righteousness’ sake: for theirs is the kingdom of heaven. Blessed are ye, when men shall revile you, and persecute you, and shall say all manner of evil against you falsely, for my sake. Rejoice, and be exceeding glad: for great is your reward in heaven: for so persecuted they the prophets which were before you.” The main principle that blesses these dear people is that they gain an invaluable perspective on life. One that the whole world really needs. Imagine your hopes being dashed time and again. Imagine leading a life where there’s a constant struggle to meet the most basic needs, and where the normal people around you go on paying little attention to you, to your problems and needs. Even fellow believers who live normally don’t seem to understand you and your situation. Often times you are just on your own and you don’t know how you will make it to the next day. There is no place to turn but to God. Because of their constant trials, our dear asylum seeking friends have developed a strong and deep faith. In spite of their circumstances, God’s favor is upon them. They move from crisis to crisis and with each one their faith grows a little bit more. This means they have special qualities that the world needs. Number one, they know who they can trust, and it’s God. People come and people go and help from them comes and it goes, but the one that never leaves them is God. Most of them will tell you that before they came to Bangkok, they lead a sort of routine existence that didn’t include the kind of extraordinary faith they have developed since coming here. Time and again they’ve been up against a wall with seemingly no place to go, and time and time again they’ve survived it, and each time because of their faith in God. It’s not unreasonable to help these people so that we can be blessed, too. Some of their blessing rubs off on us. What I’m trying to say is that those of us who help these people are the ones who benefit the most, and we need them more than they need us. In the West especially, a big system of essentially selfishness has been set up. Money is the central purpose of that system and basically what it has done is corrupted everyone and made them selfish. To survive, our race must learn to live by Love instead of money. Asylum seekers are a whole lot farther down that road than most. Through painful experience they have been blessed to acquire a different set of values. Values of Love where we help each other even when it means we will have nothing left ourselves because we simply trust that God will provide. If we join our cause to theirs, then we can learn those values of Love too. And that can spread and change the world. In fact, I think it is the way that the world will change. We are at a crossroads now and we have to learn to love each other if we will survive. That means overcoming money as our motivator and transitioning instead to Love. Whether Love wins in our lives or selfishness is determined by our allegiance either to money or to people – the vulnerable people whose lives we could change by caring for them. If we choose Love it will produce a reordering of society that it needs to survive. We can’t survive living by selfishness. If people like our asylum seeking friends are instrumental in bringing about this reordering of society around Love that is so necessary for our survival, then you can see how blessed they are to play such an important role. Do their lives depend on us, or do our lives depend on them? It’s something to ponder. Do you want to know about asylum seekers and find ways you can get involved and build relationships with them? Do you have talents and ideas you’d like to share that can help with their survival? Let us know by filling out the form below and we will send you more information.